We have a team of technical experts who work hard day and night in order to add more diamonds in the crown called "Technology". 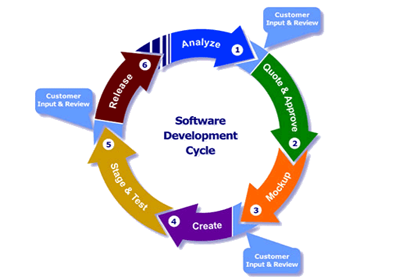 Our software development process entails to provide the best-in-class software products to the clients. User experience is our forte while developing software. We are the best-in-class UI/UX developers on board. The process involves numerous steps and procedures which are all clubbed together to provide the best results finally reaching out to our consumers. Our motive is to deliver error-free products and this task requires efficient team work and expert individual efforts also. The software applications are first created keeping in mind the client's needs and requirements and once ready, they are handed over to the testing team for further improvements. User experience is our prime concern and based on that the software are created and developed. Our organization has an entirely different approach for developing software and a unique methodology is instilled into this entire process of software development. The initial step that we undertake is to develop a framework for the software development process. This framework is different for every project. We move forward step by step in order to avoid any errors. The final step involves a meeting of all team members where they sit together and discuss about all the loopholes and bottle necks of the development process and the software thereafter. Testing of security measures is also done and finally the product is released. The whole process of development involves complete dedication and a high-quality observation so that the ultimate product is free from any bugs or glitches.